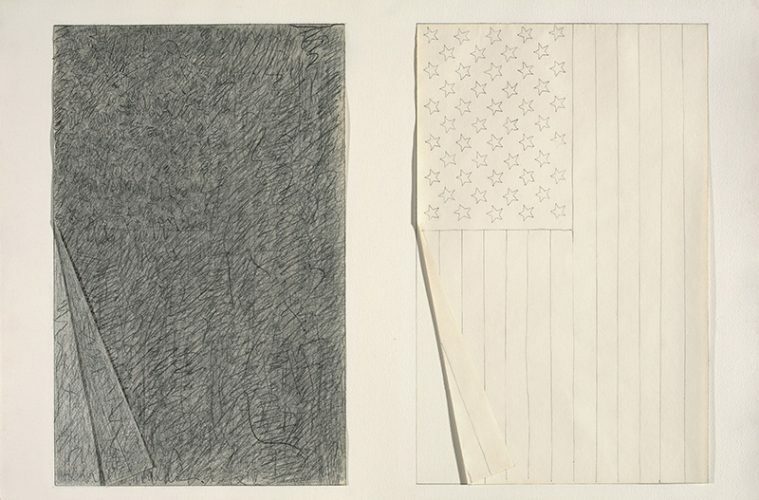 Jasper Johns, Two Flags, 1969. Graphite pencil and collage on paper. 22 1/4 x 30 3/4 in. (56.5 x 78.1 cm). The Menil Collection, Houston. © 2018 Jasper Johns / Licensed by VAGA at Artists Rights Society (ARS), NY. 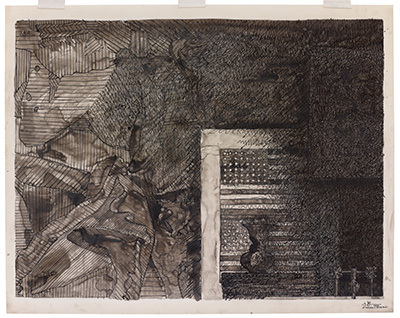 On view through Jan. 27, The Condition of Being Here at the newly-inaugurated Menil Drawing Institute (MDI) in Houston includes a selection of Jasper Johns’s drawings dating from 1954 to 2016, many of which get at the fragility of the body and its musings. It’s a fitting first exhibition at the Johnston Marklee building, in which the architecture perfectly complements the intimacy of the medium, while always taking into consideration the human scale of the viewer. The exhibition is organized according to a series of motifs that Johns has returned to since his decision in 1954 to become an artist: American flags, faces, targets, maps, numbers, body imprints, and a photograph of Lucien Freud, among others. Jasper Johns, Untitled, 1984. Ink on plastic, 26 3/8 x 34 ¼ in. (67 x 87 cm). The Menil Collection, promised gift of Janie C. Lee. © 2018 Jasper Johns / Licensed by VAGA at Artists Rights Society (ARS), NY. What’s striking is that the motifs recur over long spans of time: the flag shows up over and over across decades, for example, metamorphosing in each iteration. While this might be understood as a formal repetition, there’s a different exploration happening each time. In that way, Johns uses drawing to generate new ideas, even (and especially) through revisiting these forms. Montana describes the ways in which his motifs start to permutate, changing as he works through the ideas they offer. 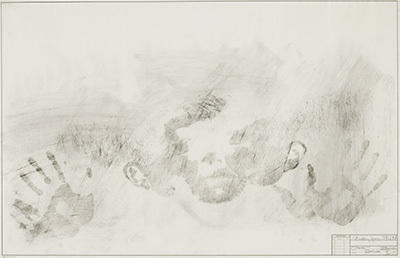 In a series of charcoal and oil drawings on drafting paper that he made in the 1960s and 70s, Johns would cover his skin with oil and press it against the paper. Then, as if tracing a cemetery marker, he would rub charcoal over the greasy impression, leaving behind rough contours of his body. Jasper Johns, Skin, 1965. Charcoal and oil on drafting paper, Overall: 22 x 34 in. (55.9 x 86.4 cm). Promised Gift from the Collection of Louisa Stude Sarofim. © 2018 Jasper Johns / Licensed by VAGA at Artists Rights Society (ARS), NY. It is impossible to think about Johns’s invocation of the body in his drawings, without also considering the building that holds them. Opened to international fanfare the first weekend of November, the MDI is the first standalone building in the U.S. dedicated exclusively to drawing: to studying, preserving, and exhibiting it. “The gallery space is only just a part of the bulk of this building,” notes Montana. Indeed, in the 30,000 square-foot building, spaces for curatorial work and research fellows sit alongside a stunning, state-of-the-art conservation studio and viewing rooms. Storage for the 2500 drawings currently in the collection (with room for the collection to grow) is under the building, in a space specifically designed during Hurricane Harvey to protect the collection, even through impending floods and environmental disasters. 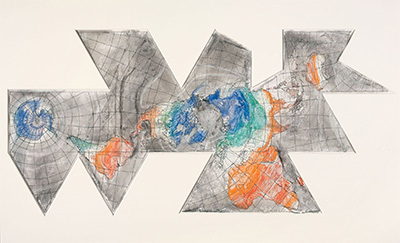 Jasper Johns, Study for 1st Version of Map (Based on Buckminster Fuller’s DymaxionAirocean World), 1967. Pastel over Photostat on paper, 30 x 55 1/4 in. (76.2 x 140.3 cm). The Menil Collection, Houston, Bequest of David Whitney. © 2018 Jasper Johns / Licensed by VAGA at Artists Rights Society (ARS), NY. But after listing those impressive credentials, the building is perhaps most notable for its lightness, its human scale, and its consideration of how to make visitors feel at home. The large entry space is even called the Living Room. The building sits low into the grounds of the Menil campus, with angled steel plates framing courtyards that make the divide between inside and outside feel permeable. Like other Menil structures, this one is in gentle balance with the changing light and landscape of its home, a cool retreat from Houston’s endless summers and extreme weather. It’s a reminder that excellence in architectural design never needs to be bombastic but, rather, reflective of where it lives. The exhibition is accompanied by Breslin’s catalog and the Menil is also publishing a 10-volume catalogue raisonné of Johns’s work. At once modest and intimate, The Condition of Being Here speaks volumes about the institution’s rigorous scholarly contribution to the field while maintaining its longstanding emphasis upon community by making inviting spaces to house and show the collection. That is to say, this new center and its first exhibition continue the Menil’s institutional commitment to making research-driven exhibitions and their homes at once innovative, intimate, and responsive to their specific environment and many audiences. To see Johns’s thinking process through the many permutations of his drawings is to re-think not only his artistic production, but also how we understand the ways drawing functions in such a well-known artist’s oeuvre. Johns reminds us that drawing is a medium very connected to the body, and to meditations about ephemerality. Significantly, the building is structured in a way to observe and protect the most humble materials and visual gestures. Instead of grandiosity, both building and exhibition reward the knowledge that comes from the detail. If this first exhibition and related publications are any indication, the MDI takes seriously the fragile condition of being, here.